It is a great pleasure for the Voices of Future Generations Initiative to announce that Sheikha Hissa Hamdan bin Rashid Al Maktoum has agreed to serve as its Goodwill Ambassador for the Gulf Region. Promoting children's rights and sustainable development, this unique programme empowers children to promote the UN Convention on the Rights of the Child as well as Sustainable Development Goals. Sharing her love of literature with children from around the region, Sheikha Hissa will support the development of a children’s book series authored by children, for children. These stories from around the world are illustrated and published, and the books disseminated globally to schools and libraries for all children to benefit from being able to read stories told from a child’s point of view. Every story highlights children’s rights and sustainability in creative and entertaining ways. Sheikha Hissa, a passionate horsewoman and writer, is the author of Tajaarub: From a Horsewoman’s Journey, which explores the powerful connection between humans and horses. She has led her teams of horses in practices and trainings in both England and Dubai. In her position as Goodwill Ambassador for the Gulf Region she is committed to making a real difference in the lives of young people. يسر مبادرة أصوات أجيال المستقبل أن تعلن بأن سمو الشيخة حصة بنت حمدان بن راشد آل مكتوم قد تكرمت بقبول منصب سفيرة النوايا الحسنة لمنطقة الخليج العربي، وذلك من أجل تعزيز حقوق الطفل وتوطيد دعائم التنمية المستدامة. وسوف تُسهم الشيخة حصة في ترسيخ اتفاقية هيئة الأمم المتحدة لحقوق الطفل، وتعزيز أهداف التنمية. سمو الشيخة حصة من داعمي الثقافة ومحبي الأدب، وتشارك الأطفال من جميع أنحاء منطقتنا محبتهم للأدب، وستدعم سلسلة الكتب التي يؤلفها الأطفال للأطفال؛ وهي سلسلة تشتمل على قصص مصورة من جميع أنحاء العالم، وسيتم نشرها وتوزيعها على مكتبات ومدارس العالم ليتمكن الأطفال من مطالعة القصص التي يرويها أقرانهم بطرق مبتكرة ومسلية. الفارسة الشيخة حصة بنت حمدان بن راشد آل مكتوم، كاتبة مبدعة، وهي مؤلفة كتاب "تجارب مستوحاة من الفروسية"، الذي يتناول العلاقة الوطيدة المتميزة بين الخيل والإنسان، و يضم التجارب الشخصية التي خبرتها على صهوات الخيل منذ نعومة أظفارها وحتى الآن، فقد قادت الشيخة حصة تدريبات فريقها من الخيول في كل من إنجلترا ودبي. ومن خلال منصبها كسفيرة للنوايا الحسنة سوف تسهم الشيخة حصة بإحداث الفرق المنشود في حياة الشباب. We are absolutely delighted to announce the results of the 2018 Voices of Future Generations writing contest from North America and Europe! 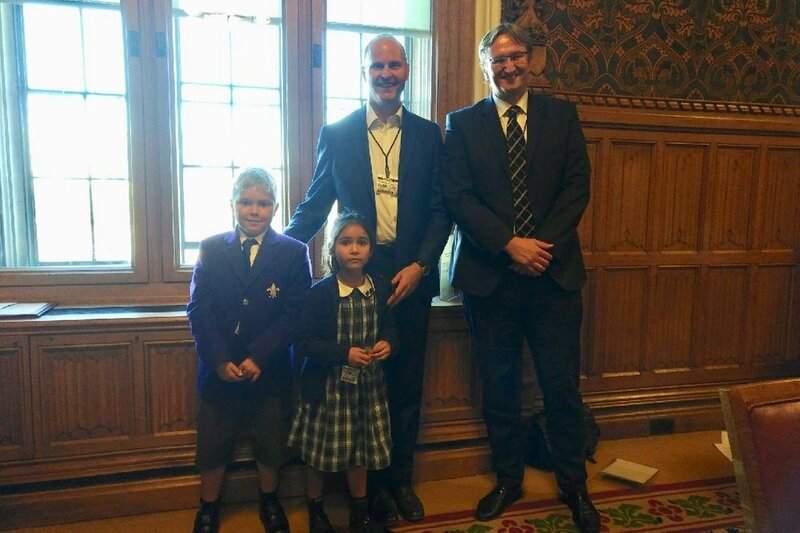 We received many wonderful entries, and the judges wish to commend all of the children who put pen to paper about issues that really matter to them. Well done, everyone! Child Author, Ying-Xuan, talks about her inspiration to write her latest story about endangered leopard cats and the unlikely siblings who reunite them with their family. This year's Gold winner is Yun-Hung Huang, age 10, who studies at the New Taipei Municipal Zhong-Zheng Elementary School in Taiwan. The story "Small Sparrow, Great Hero" really touched the judges and they were very inspiring to read about one little bird being able to enact so much change with its passion! Congratulations, Yun-Hung, on winning the Gold prize! The Voices of Future Generations International Commission look forwards to working with you, to form your story into a book that fits the global series. The judges felt this was a very carefully and cleverly crafted piece of writing. They unanimously decided that they would like to award Hung-Yueh Cho with a special Poetry Prize, meaning that this piece of writing will be featured on our global website. Congratulations! Thank you again to all the children who entered, from across Asia. It is always wonderful to hear your ideas and read your creative writing. Thank you, also, to EQPF and their prestigious judges for helping to facilitate the contest. Come and see us at the London Children's Book Fair - next Friday and Saturday 15th and 16th December! It is taking place at Parasol Unit, 14 Wharf Road, London N1 7RW. Jona David and Diwa Boateng will be doing special book signings on Saturday 16th, between 11am and 1pm, and 2pm until 4pm. We hope to see you there! Follow all the action from the fair on our social media (@VoFGChildren), and also @thelondonchildrensbookfair on Instagram, hashtag #tlcbf17. Voices Child Author, Lupe, has won the 2017 Samoan Observer's National Short Story Competition. We are thrilled to hear the news, and to be able to share the newspaper article featuring her story here, which deals with violence against the environment and features a very poignant poem. A new Child Author from Morocco? At the UN General Assembly High Level Event on Climate Education, Children and Youth, Jona presented CoP 22 President Salaheddine Mezouar with a special certificate of thanks, and asked, on behalf of all the children, if Voices might be able to find a new Child Author from Morocco. Mr Mezouar's response? "C'est possible"! Jona is thrilled, and can't wait to tell the others! Jona and Allison speak out for Climate Action at UNGA! On 20 September 2017 Jona and Allison were invited to the UNGA! 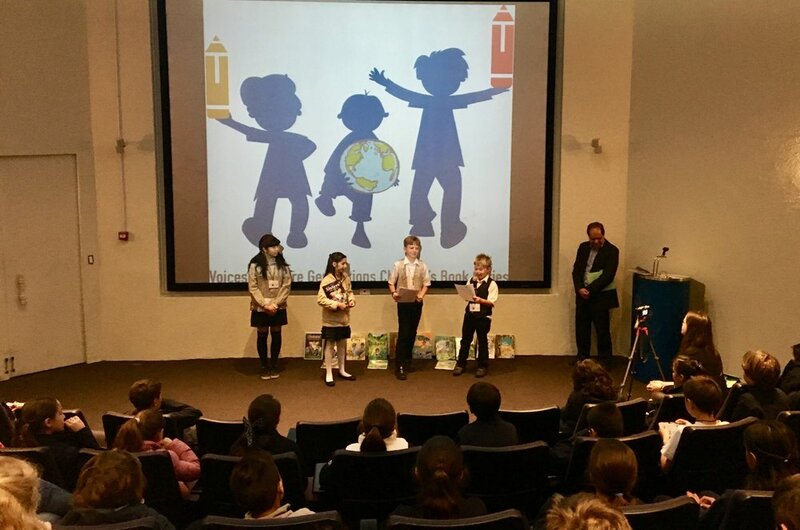 They spoke at the High Level Event on Climate Education, Children and Youth at the Climate Week in New York City, hosted at UNICEF Headquarters. Unfortunately Allison Lievano-Gomez from Mexico City (and UNICEF consultative board member!) could not be with us in person, but she recorded a really special video speech for the panel, which went down a storm! See below to hear her talk about how she educated herself about climate change, and what she hopes leaders of this world will promise to do for the future of the Earth. Jona was also brilliant, in his communication of what the world must do to help combat climate change, linking his speech wonderfully to the SDGs. My name is Jona David and I am 12 years old. I come from 4 countries - the UK, Switzerland, Germany and Canada. It is a huge honour to speak with you here in New York at UNICEF Headquarters. First, thank you for being leaders, and for everything you're trying to do to tackle climate change. Education and action on climate change, today, is desperately, seriously important. THANK YOU. You are raising your voices for a more sustainable future. That's what I am doing too. My first four books are being published in six UN languages by the UN and the Voices of Future Generations book series. It is amazingly exciting! With the UN book series, I have been really fortunate to be able to travel to different cities like New York, London, Mexico City, Taipei, Hamburg, Berne, Ottawa and even Rabat in Morocco, in order to share my stories with other children who are interested. My work is especially to reach out to other children in my region, with a different, more active education. 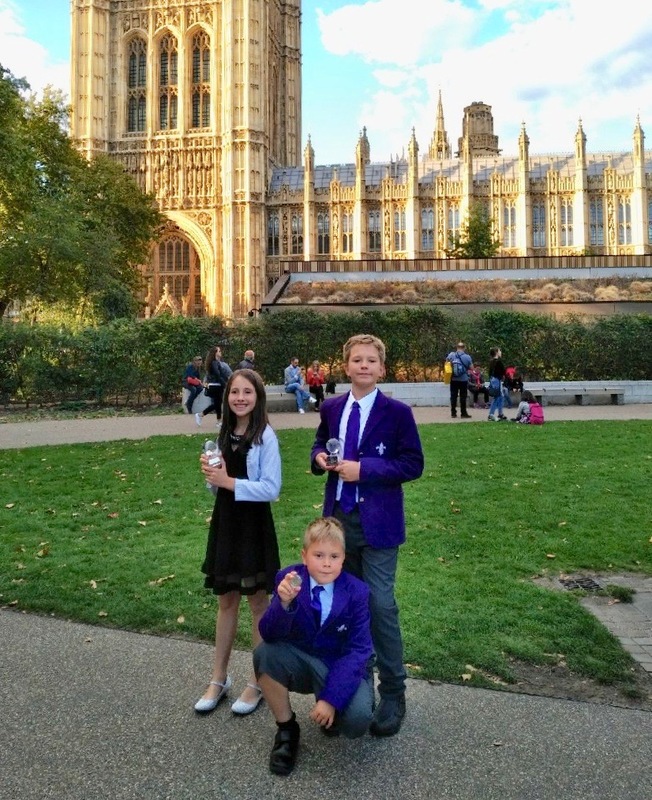 Through our books, educational work, awareness-raising events and projects, all of us Child Authors are trying to speak out for our rights, for our Earth, for the Future We Want. I am also trying to say that it is important to have the courage to be ourselves, and to stand up for each other. Not just for children today, but for future generations of our children. Raise your hand if you think things are crucial too? Other world leaders agree with us. The UN Convention on the Rights of the Child has already celebrated it's 25th Anniversary. It is a global accord for all children that our rights to a healthy environment, to food and water, and to education will be respected. And here at the United Nations two years ago, out countries came together to commit to a new set of Sustainable Development Goals. The SDGs are a set of global goals that all countries can agree to tackle together, whether they are rich or poor, developed or developing. One of the crucial goals was SDG 13 - to take urgent action to combat climate change. We were here, in New York, hosting a United Nations Children's Summit on the SDGs, alongside. All of us kids in the Summit promised to become Child Ambassadors for these new goals. And we are keeping to that promise. We were deeply inspired when we heard the same countries had signed the Paris Agreement on climate change, committing to reducing their greenhouse gas emissions, support adaptation, report on their efforts and raise awareness everywhere for climate action. But, raise your hand, if you think all these Goals, especially stopping climate change, and the climate treaty itself, will NOT be easy to deliver? You are RIGHT. The challenge is that we have a really long way to go, all over the world, to ensure that the rights and interests of future generations are respected, towards sustainable development. Sustainability is crucial for the survival of humanity and our Earth. For all of us, especially children, learning to live sustainably is the difference between terrible global nightmare, and real hope for the future. If we carry on consuming and polluting, our ecosystems and all our resources will burn out. If highways, rubbish and oil spills take over, animals and plants will be miserable and ill. If we let climate change get worse, many people will be hurt or even die in floods and typhoons. After all these global promises, it would be terrible if rather than implementing the SDGs and the Paris Agreement, we keep going backwards, doing the exact opposite. And today, children can help. In the Children's Declaration from our Summit, we asked everyone to recognise that "the decisions the world makes today will impact and define our future". We pledged to be "the voices of future generations...current global citizens who must play a part in decision-making". After all my own struggles with dyslexia, I'm working to keep that pledge through my writing, and speeches like this one, with you today. In my stories it's clear. Even the smallest child can make a huge difference for our planet. All of us can take action and ramp us as eco-leaders in our own communities - starting today! There is so much that children can do to defend the needs and interests of future generations. We can get started by changing our education, not our climate. Here are three ideas! First, our schools and communities can adopt new eco-science and technologies, for more sustainable education. This can spark everyone to become interested in eco-science for the rest of our lives and to learn how to use it every day. Schools can pilot renewable energy, such as solar panels, wind or even geothermal power. We can insist on sustainable transport with hybrid school buses, bikes or skateboards. We can provide new SDG books and workshops as the amazing Mohammed VI Foundation for Environmental Protection does in Morocco. Second, we can work together to make our whole economy greener. This way, when children grow up, our careers will help instead of hurting the environment. We can all work together to fight climate change and to ensure people respect ecological limits instead of always breaking them. Third, children (and world leaders) can speak out as advocates for future generations, worldwide. The UN Convention on the Rights of the Child promises us the right to be part of decision-making. We can raise awareness to make these things happen on the ground. Even as children, we can blog, use new media to network with others, make posters, start our own radio shows or even write our own books! Two Child Authors are from the Pacific. Please, include us in the CoP23 Education Day! Us Child Authors can help! When it comes to the Earth, our own survival, and the survival of all future generations, is at stake. It's urgent. Children's voices can tell others about problems. But most importantly, we can also become part of many solutions, on the ground, all over the world. What do you think children can do to help combat climate change? Make your suggestions to us! Allison is working hard on her second story! Her first story, The Sisters’ Mind Connection, has been hugely popular and we imagine the next, which will be about migrant and refugee children, will be the same. Allison has dedicated a lot of time already to preparing the next book for the Voices series, including field trips to meet a refugee community in Villahermosa, Tabasco, Mexico to learn about their lives. Here is Allison with Elisa. Elisa García is originally from Spain. She is trained as a lawyer and specialized in international refugee law. Elisa took the plunge last year: she was approached at an academic conference by the Government of Tabasco and offered the job as founding director of Albergue Colibrí. J. is 16 and is 5 months pregnant. She is from Honduras. Shy and guarded, she lightened up when Allison showed her her book and teared up when Hazel called her courageous. Jona David was invited by the Canadian Commission of UNESCO to give a keynote speech in a plenary at their Global Citizenship Education Forum last week. He received a standing ovation for his speech, and Jona and his three stories were very quickly adopted by the UNESCO Youth Commission! Jona also had the opportunity to present the Hon. Catherine McKenna with a set of his newly published hard cover storybooks, and a full set of all of the children's books to Ms Irina Bokova, Director-General of UNESCO. 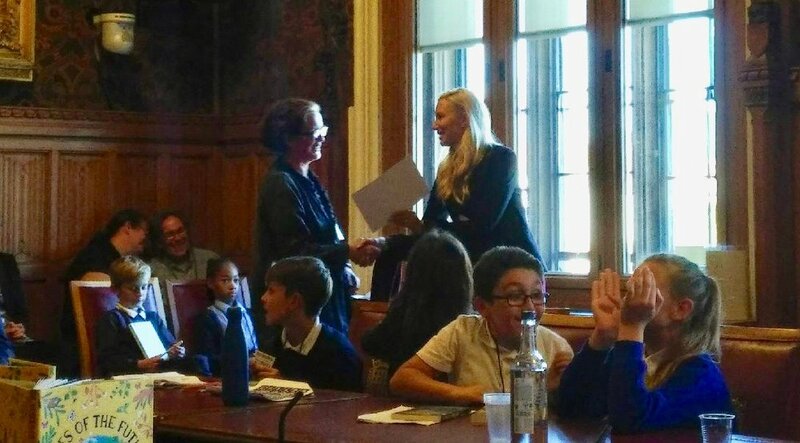 A really informative and inspirational day - thank you from Voices of Future Generations to all at UNESCO, with special thanks to Lydia Ruprecht, for facilitating it! Jona David meets the Hon Catherine McKenna and Walking Stick Bug! ‎Jona David, 11, UNESCO / VoFG Child Author, met the Hon Catherine McKenna, Canada's Minister of Environment and Climate Change, on Family Day at the Museum of Nature in Ottawa. 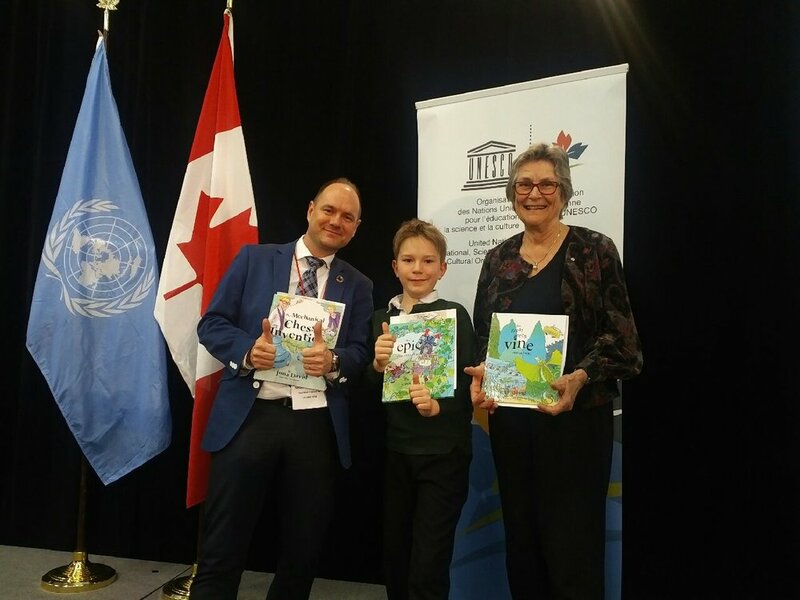 The two served as a shared 'tree branch' for one of Canada's most fascinating insects, the Northern Walking Stick, and she asked about his work to raise awareness about the world's Sustainable Development Goals (SDGs) through his eco-inventor boy books and public speaking, helping implement the Convention on the Rights of the Child. Jona is a resident of the Glebe in Minister McKenna's constituency, and active in local eco-societies and nature clubs, and his 3rd book, The Mechanical Chess Invention, will be launched on 11 March 2017 at 2pm in Kaleidoscope Kids' Bookstore (1018 Bank St, Ottawa).